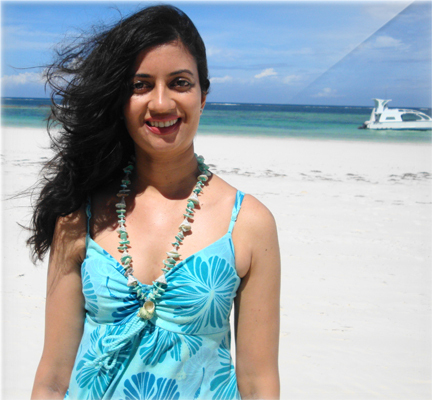 “I was born and brought up in Mombasa, the exotic tropical paradise of Kenya. Living on the coast, I have grown up amidst stunning surroundings with clear blue skies, whispering palm trees, pristine white sandy beaches and the turquoise blue ocean. I have had a very special and deep connection with the ocean since childhood. My love for the sea has had a very strong influence in my life and on my creativity. As a child, I used to love collecting shells from the sea shore and building sandcastles on the beach. I would spend hours playing with the sand and creating new sandcastles each time, embellishing them with shells, seaweed and tropical flowers, completely submerged in my own magical world by the sea. The same feeling is evoked when I work on my seascapes, experimenting with paints, sand and various mixed media and creating interesting textures using different techniques on canvas. I am absolutely mesmerized by the eternal ebb and flow of the sea.....the rhythm of the waves.....the depth and vastness of the ocean.....the kaleidoscope of azure waters.....and the diverse moods of the sea which I try to capture on canvas. I feel a strong magnetic attraction towards the colours of the ocean, which is why blue holds a prominent place in my colour palette. 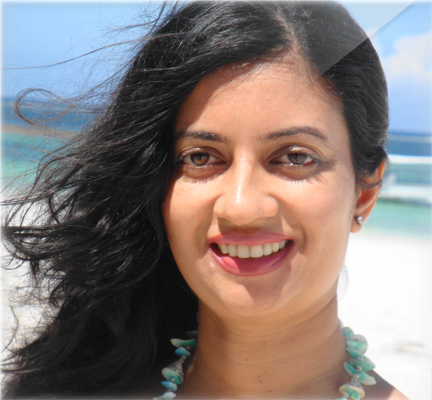 To me, the sea symbolizes the true essence of life.....and this is what I try to portray in my paintings.” Seetaa Shah. Seetaa’s art brings home an element of nature. Her work speaks of flow, the dolphin frequencies and a beautiful, fresh blend of colours. What does the ocean mean to you? Its expanse is formidable, yet the softness with which it bathes the body & its essence is gentle. This Artist’s paintings will add a unique freshness to your walls & to your life.